reCup paper cups can be printed in full color or process inks that are all specialized to be food safe and odorless and we also use the highest resolution we can to make the images on your personalized paper cup appear professional, flawless and a display of the highest quality that your business can be proud of. 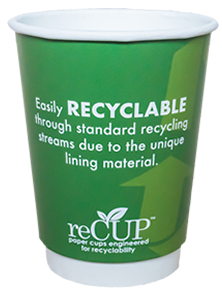 These reCup paper cups are available from 1,000 units up to 250,000 in the double wall version. So we can cover you from small runs or large runs depending on your needs. The eco double wall design means two layers of board are used in making this paper cup so there is no need for a sleeve/clutch to protect your hand from the hot contents. The reCup uses a revolutionary interior lining called EarthCoating rather than traditional PE or PLA . This coating is made using a blend of Calcium Carbonate which fragments away from the paperboard into small particles which can be easily separated during the standard recycling process. This means they can be processed alongside standard paper recycling as if there wasn't even a coating on them.